One of two police officers wounded over in a weekend shootout, which left a suspect dead in a College-area apartment, went home Monday to continue recuperating, police said. Dan Bihum, an 18-year veteran of the San Diego Police Department, was discharged from a trauma center two days after he and fellow patrolman Francisco Roman were shot while trying to enter a Rolando Court residence in response to an emergency call. Finding themselves under attack, Roman and a third officer returned fire. The suspected assailant, 28-year-old Joe M. Darwish, was later found dead inside his rental residence. Roman, a three-year department member, remained hospitalized this afternoon in stable condition, Lt. Anthony Dupree said. 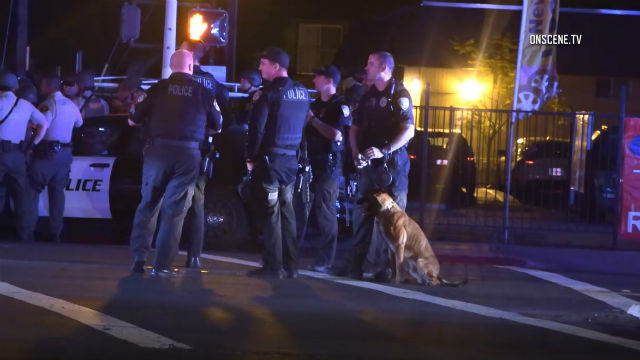 The events that led to the exchange of gunfire began about 10:15 p.m. Saturday, when a loud and violent-sounding dispute was reported in a neighborhood just southeast of San Diego State University. As officers were trying to contact any occupants of the apartment where the disturbance had occurred, they noticed the smell of something burning. Getting no response from anyone in the residence and believing there might be a fire starting, the patrol personnel made entry and were immediately met with gunfire, Dupree said. Roman and Officer Shawn Boggeman shot back before retreating and seeking help for the wounded patrolmen. Medics took Bihum and Roman to hospitals, where they were admitted in stable condition. A SWAT team, meanwhile, was summoned to take up positions around Darwish’s apartment and prepare to enter it forcibly, if necessary. After several hours, the special weapons and tactics personnel stormed into the residence and found Darwish dead. It was not immediately clear if he had succumbed to police gunfire or if he might have shot himself. Darwish had a “criminal history,” and police had responded to incidents at his apartment “numerous times over the last several years,” SDPD Chief David Nisleit told reporters.